Smirnoff & Buddy Hackett Ad 1966 This is a January 1, 1966 advertisement It is a nice color ad from Smirnoff Vodka. Pictures Bobby Hackett star of stage, screen and television. He is bursting through a wall of green paper and is carrying bottles of Smirnoff. In mint condition. Photo is taken through plastic and may show wrinkles or crookedness that is not in the ad. This magazine tear sheet measures approximately 8"" wide by 11"" tall. 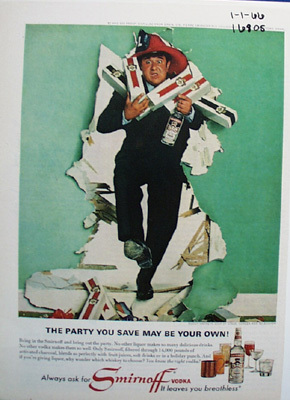 Items Similar To "Smirnoff & Buddy Hackett Ad 1966"